My timing could not have been more perfect. Outside Mother Nature is creating a Winter Wonderland, and inside I’ve finished a lusciously warm brioche stitch neck warmer. Not much science to this one: brioche stitch in the round, worked over 64 sts on US 8 needles. If some guidance is necessary, this very pattern is in Weekend Knitting . It’s the yarn that makes this project noteworthy – the wonderfully soft and plush Malabrigo worsted merino. 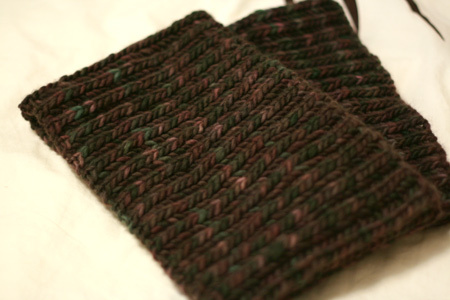 This 6.25″ high neck warmer used up a bit more than half a skein of the Black Forest colorway (#179). This is my first time knitting with Malabrigo – can you believe it?!? I’ve worked with the laceweight merino Malabrigo in the past (not too successfully, I’ll add), and at last the worsted weight has found its way onto my needles. Ahh, it is divine. It will pill like a mofo and become a felted fuzz ball in about 2 days, but for now, it is divine, and feels wonderful against the neck. Knitting with Malabrigo was entirely pleasurable. In fact, this is the second brioche/Malabrigo neck warmer I’ve knit – the first is already with my dad – and my third brioche/Malabrigo project is on its way. I just can’t stop! 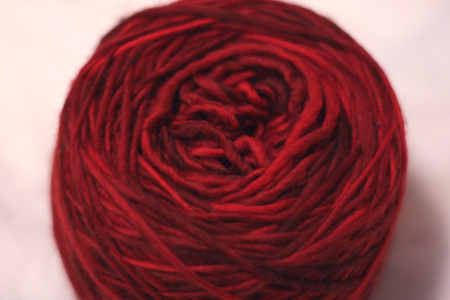 i think i am in love with the burgundy yarn…. that color is gorgeous! enjoy the storm, i hope you dont have to go anywhere in a car! IME, Malabrigo is one of those yarns that pills incredibly–once. Soon enough the loose fibers are all gone and it’s still soft, cozy–and pretty much pill-free! I love the malabrigo merino, it is divine! I have a scarf made out of it and it is like knitting with butter. 🙂 I am in the middle of knitting a doggie sweater for my new niece, Libby, she is a little black pug. This is her Christmas present. The malabrigo lace is another story, it was like it was rotten and kept pulling apart when I would knit with it. It is very beautiful here in Boston, isn’t it? Your neckwarmer may just have to make it onto my needles. I have some yarn that’s been waiting for the perfect project. I’ll be staying in and knitting this evening after I get some online holiday shopping done. Keep warm and stay safe! Neckwarmers must be the new it thing or it’s just all the ice outside because I’ve knit two up this week as well. I love the shades you chose, the black forest especially. The different colors are so harmonious. Beautiful…and you’re okay with the wool against your neck? Malabrigo is the best, I’m totally addicted to it. Lovely colors too. That’s so funny…I just ordered my first skeins of Malabrigo today! Oh, those are such wonderful colorways. Maybe I can find a reason to justify buying more yarn…. It must be frightening weather out there. I’d never thought to see you with a neckwarmer. How long have you actually worn it around your neck? About as long as it takes to get a decent picture? I knit a pair of fingerless gloves yesterday during the storm, also from Malabrigo. Love that collar! Beautiful color – and a great quick gift idea, too! Beautiful. Does it stretch enough to go over your head without getting all stretched out and wonky? That’s what I always worry about with those. 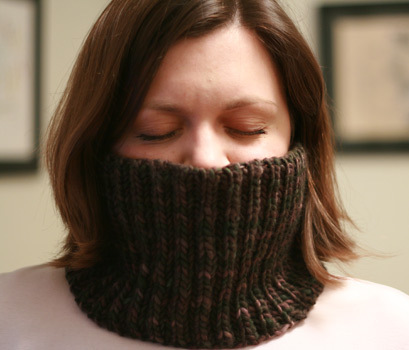 I have never knit a neck warmer, but yours looks so warm and cozy that I may have to consider it. I adore malabrigo too! I have one hat from the hat a thon from it and another on the needles for me. Love your neck warmers, they are great and will be so appreciated!! Kat with a K – I can’t answer for Grumperina’s actual results, but my experience is that Malabrigo has tremendous give. Brioche stitch is also very stretchy. I’ve also found that it doesn’t pill as much as you’d think, nor felt as easily. As someone above commented, it pills once and it’s done. I have a Knitty hat that I made from some leftover Malabrigo and it has yet to pill. I wear it religiously nearly every day so I think you will be pleasantly surprised. Gorgeous colorway! What a great project! Looks so warm and squishy! Saints preserve us, Malabrigo is the best thing ever. I will take that statement to the grave. It’s so insanely soft, the colors are amazing, and it is pretty friggin’ cheap for the quality. I just picked up a skein of the laceweight and now I am flat-out obsessed. I love all of the items I’ve knit from Malabrigo. It might pill, but once it gets over that stage (and I have store bought things I can’t wear because they shed over everything. Malabrigo is 1000x better than that) it is a dream to wear. It will pill, felt and fuzz and you will still love it! This yarn is one of those addictions for which there need be no apologies. Happy Malabrigo knitting and welcome to the club! Actually, Kathy, I knit a brim cap (you know, those things that look good on skater guys but on me probably tell everyone just exactly how old I am) in Malabrigo worsted, and because it was a spun single and not plied, I was sure it would pill but didn’t care. You know what? Everyone still knows exactly how old I am a year later, I wear it all the time, it gets heavy use (I live in Montréal. Dude, we know from heavy winter use. ), and no pills a-tall. I made a Malabrigo hat last year and it did not fuzz or pill at all after a lot of use both last year and this year. I love that yarn! SO soft! Oh, I hope you don’t have any problems wearing it because Malabrigo merino worsted is so nice. So lovely and perfect for the weather!